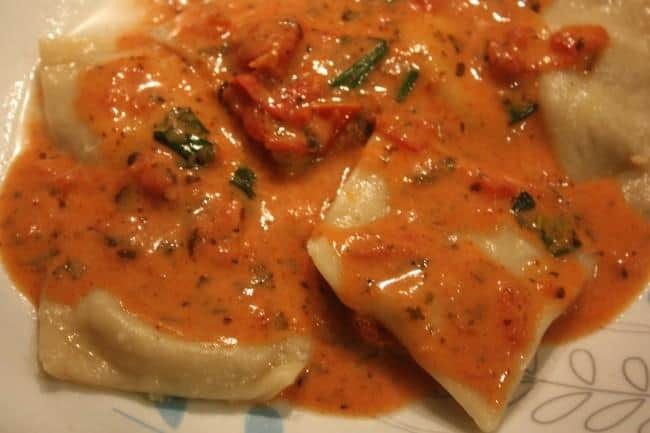 So, you wanna make ravioli? First, you’re going to have to pick a path. Would you rather take the easy way or the harder way? Easy way out (aka cheating): Substitute dumpling/wonton skins (buy at a Chinese supermarket—just watch out for eggs!) for ravioli dough. No kneading, no rolling, no mess! The hard way: Prepare to spend a few hours in the kitchen. Probably best to clear out a Sunday afternoon. The hard way means you’re going to get a gourmet-ish meal. But you know what? You don’t need all the fancy equipment most ravioli recipes call for. What you need is a little creativity. No pasta machine? No ravioli cutter? No cookie cutter or even a rolling pin? No problem! These measurements are approximate. Essentially what you want to do is form a well in the flour, put the water in the well, and mix the flour and water together. Add more water as necessary until the dough just sticks together. Once the dough sticks together, knead it for a few minutes, then set the dough aside while you make the filling. Time to prepare the filling. 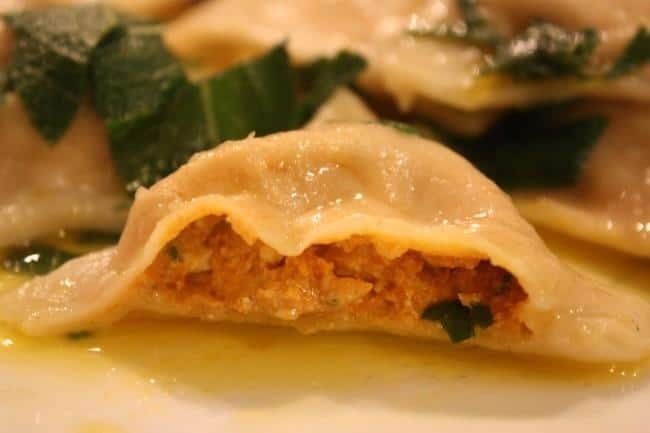 They’re your ravioli, and you can put anything in them you like. I personally like a spinach-(faux) ricotta filling, but butternut squash is nice as well, or if you’re one of those fungus people, you could throw in some mushrooms. Whip up whatever filing you fancy. If you’re using wonton skins, skip this step. If you’re really lucky, you own a pasta machine. If you’ve got an average amount of luck, you have a rolling pin. 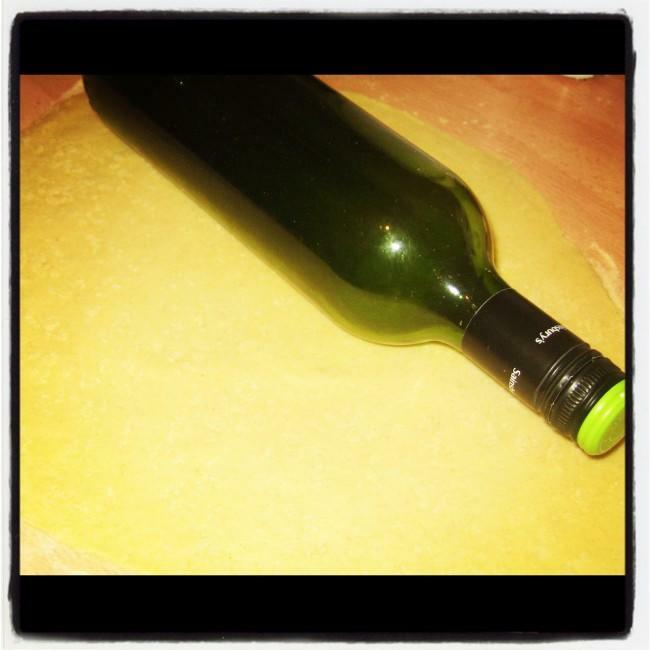 If you’re me/you’re too cheap to buy a rolling pin, this is where the problems in most conventional recipes start. But don’t panic, just grab an empty wine bottle (oh come on, don’t tell me you don’t have one of those?!). It’ll be almost as good as a rolling pin. Now you’re going to need something to cut the dough. Look around your house. Do you have a small round or square cookie cutter? A water glass? Maybe you’re like me, and you’ve got an incredibly ill-equipped kitchen with none of the above. Don’t fret, keep looking for something suitable. In the end I settled on a small candle holder. 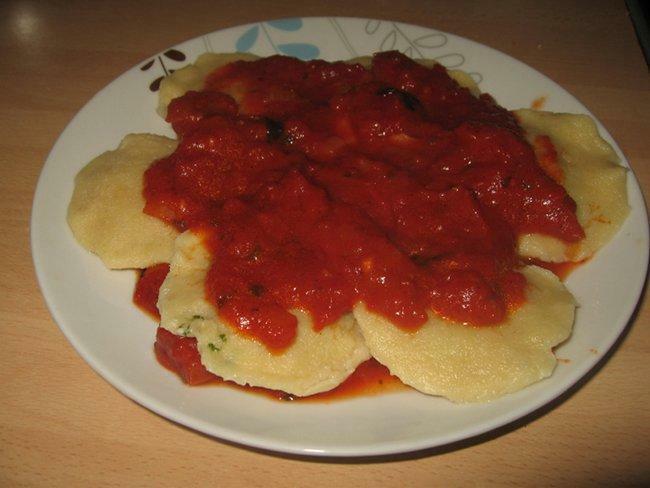 Got something vaguely ravioli shaped now? Good. Now get to work cutting out circles or squares. Put a small amount of filling onto each dough piece, and press another piece of dough on top of it, sealing the edges. You’ve made ravioli!! How hungry are you? 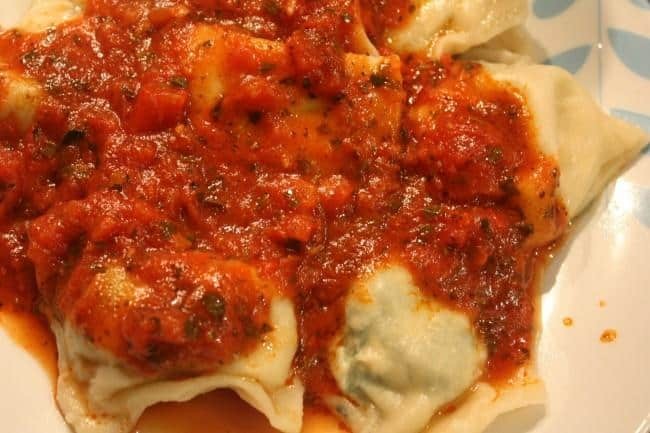 If you’re not going to eat all the ravioli, now is the time to store the extras in the freezer. Place them on a cookie sheet or plate and then once they’re frozen you can stack them in plastic containers/Tupperware. Bring some water to a boil and throw in the ravioli you are going to eat right now. Leave them in the water for 3-4 minutes. When they’re almost done, they’ll bob to the surface (unless they’ve gotten stuck to the bottom of your pot!). Give them another 30-60 seconds after they bob to the surface, and then fish them out. Put your favourite sauce on them, and it’s time to eat! What a great discovery this site is! The photography is beautiful, the writing style is cheerful, and the recipes sound excellent. Brings a bit of chic, cosmopolitan London into my life in the heart of the Illinois prairies.Keep it coming! Thank you! Glad you enjoyed the site!